Social media is all the rage now. Every company has a Facebook Page, Instagram Account, or Twitter Account. However, many businesses find it a challenge to trigger consumer interest or recruit members on social media. Somehow or other, run-of-the-mill content like inspirational quotes, blog posts or product highlights alone just won’t cut it. This is where social media contests and other promotions come in. Focused on gamification, social promotions can be easily tracked, monitored and measured on social networks like Facebook and Instagram. Social promotion apps and tools like Wishpond and Binkd make it easy for your brand to gain momentum through carefully considered social promotions like contests, giveaways, and lucky draws. So what can you do to kickstart your social media campaigns? Considered the easiest kind of contest for your Facebook and other social media fans to enter, lucky draws are able to generate more sign-ups to your mailing list or “likes” to your Facebook page than any other contest. Normally, lucky draws require your contestants to fill in minimal details like their name, email address, and mobile number to participate. 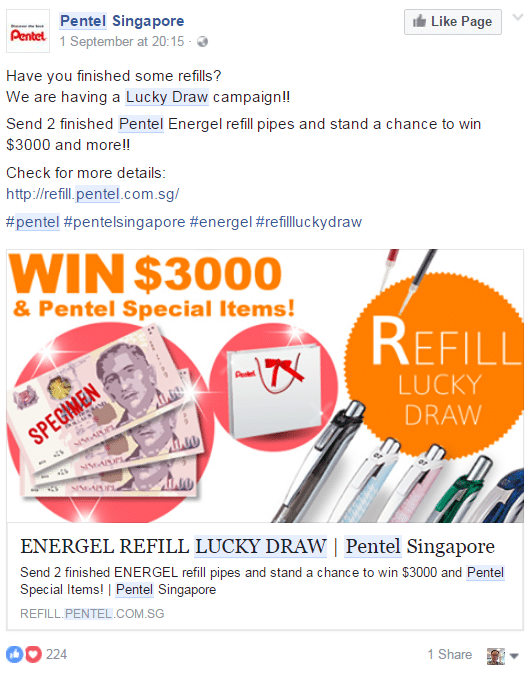 Occasionally, they may also require the submission of some “proof of purchase” like the example from Pentel below whereby participants have to submit two finished refill pipes to qualify. Due to the low chance of winning, you need to ensure that your prizes are fairly attractive to make lucky draws work. While you can probably get a large number of participants due to the ease of competing, you may also attract a lot of “contest freeloaders”. These are folks who are merely interested in winning your prize – they are unlikely to be good customers of your products or services. Like lucky draws, voting contests are easy to participate in for your customers. You can either include a public participation element (eg vote for your friends) or you can use it as a way to gauge popularity for your products or services. Voting also allows you to gain some consumer insights. You can tell what your customer is more interested in, and how interested they are in your products. Incorporate some elements of fun and intrigue. For instance, you could state that participants are helping to choose the next “Superstar” in your range. Include a hashtag for your event, brand or promotion. Here is an example of the voting contest organised by ZoukOut. 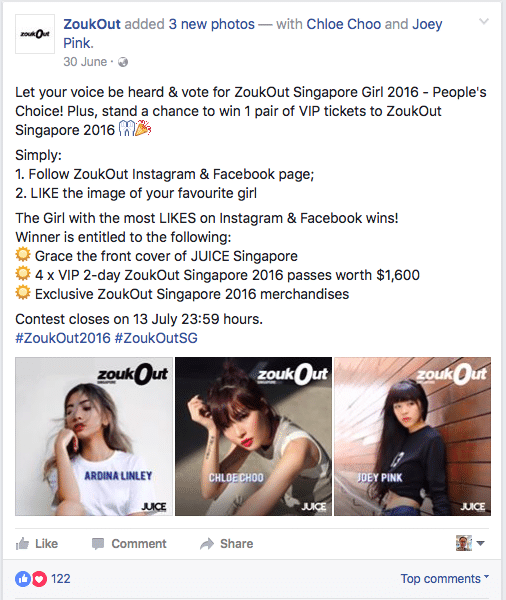 Termed the ZoukOut Singapore Girl 2016 Voting Contest, it allows the public to win a pair of VIP tickets to ZoukOut Singapore 2016, and play a role in selecting the right girl to become the ambassador for ZoukOut – Singapore’s most iconic outdoor dance event. Also known as “Refer-a-Friend” or “Tag-a-friend” promotions, Referral Promotions work very well in helping you to increase fan growth for your Facebook Page, Twitter Account, or Instagram account. The basic mechanics is that your fans are rewarded if they recommend and get friends to participate in your contest. This helps you to trigger Word Of Mouth (WOM) and virality quickly, especially if the incentives provided (like prizes) are attractive enough for the winners. An example of such a promotion is from wt+ (Wing Tai Retail) below, which offers contestants a chance to win a $500 shopping voucher by sharing their 3 favourite clothing brands under wt+ and tagging a friend whom they love to go shopping with. Note that it’s important to lay out the steps and prizes in your promotional mechanics, as well as any other Terms and Conditions (Ts & Cs). You can also include a link with further details if the space on Facebook (or other social networks) are limited. 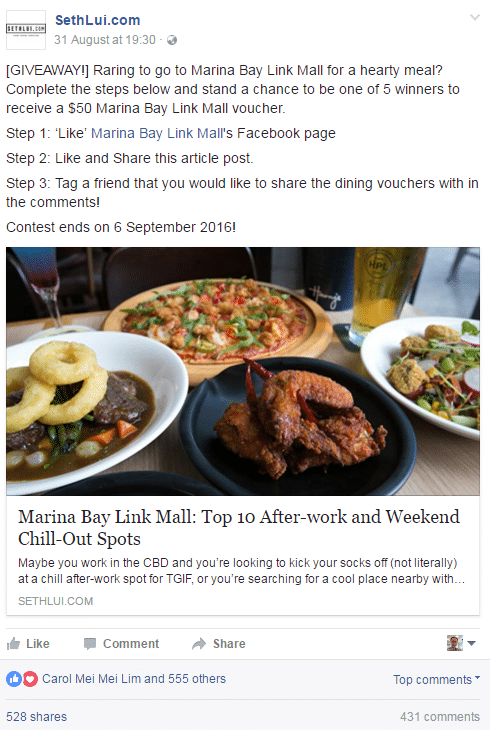 Here is another variation of the contest mechanic where you’re requested to like Marina Bay Link Mall’s Facebook page (without a compulsory Facebook gating though, as that is illegal), “Like” and share an article post, and tag a friend whom you’d wish to share the dining vouchers with. 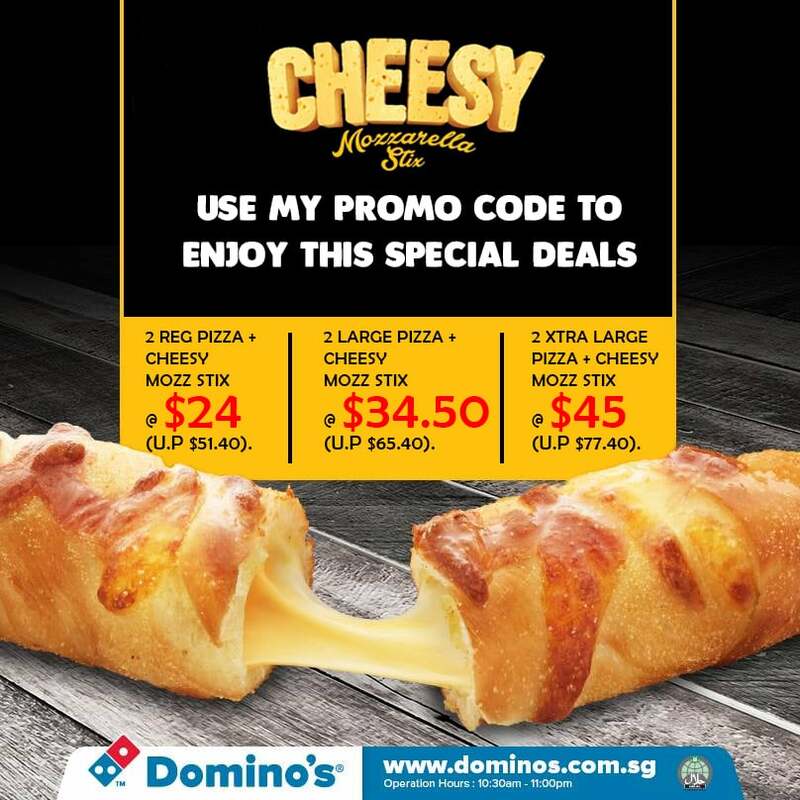 This promotion is tied to a blog post written by an online food influencer Seth Lui. Note the use of the square bracketed [GIVEAWAY!] in the post as a way to capture attention. Here is another variation of the tag-a-friend contest post, which involves writing down why a person is an awesome mum. The prize here are just samples of Pond’s different creams. In an age where everybody and their dogs are taking selfies, it makes a lot of sense to organise a photo contest. Often, this is combined with votes (ie “likes” on Facebook) to determine which is the winning photo. Photo contests are great for generating brand awareness and participation in view of their visual nature. In addition, the use of your brand hashtag helps to increase the virality of your Photo Contests require entrants to submit a photo in order to win a prize. 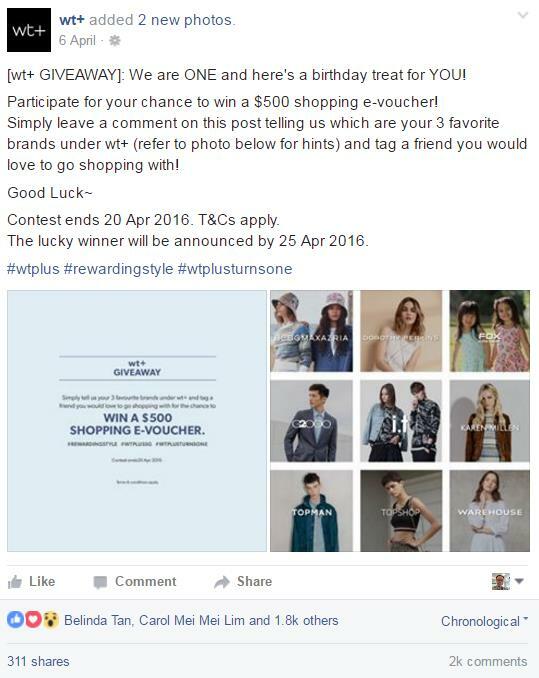 These contests are great for gathering user-generated content for your business. In addition, you can also encourage your fans to include your product or logo or colours in the image and to share it widely through their social networks. 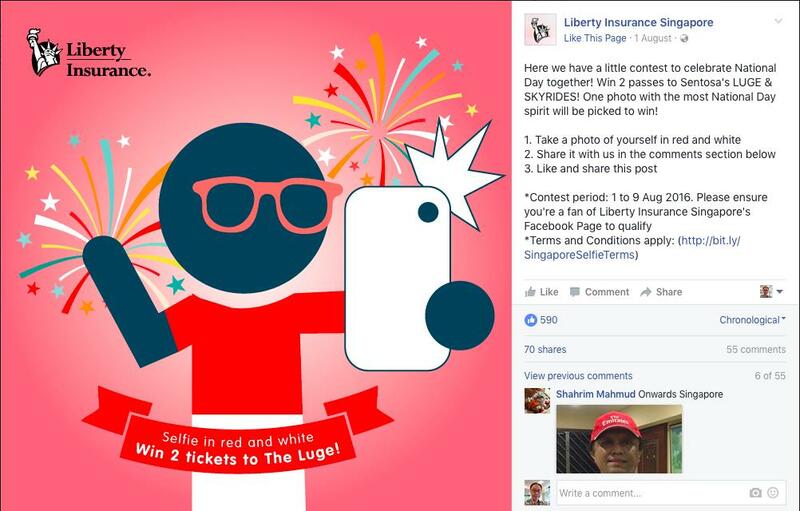 In the example below by Liberty Insurance Singapore, participants have to dress up in the colours of the Singapore flag, share that photo in the comments section, like and share the post. 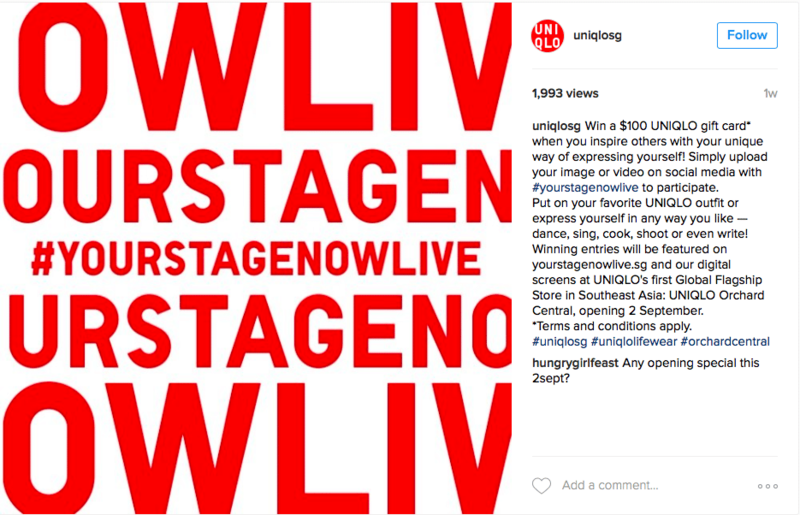 In this second example below from UNIQLO, the global brand organised an Instagram contest whereby participants are supposed to take a photo or video of themselves dressed in their favourite UNIQLO outfit, and to sing, dance, cook or express themselves in a way that fits the brand image. It is interesting to see how evergreen favourites like “Spot the Difference” or “Count the Numbers” can make a return in the digital age! For this first, all you need to do really is to create duplicates of the same image, use a photoshopping software (like Adobe Photoshop or even Powerpoint) to edit one of the images, and present both for people to identify. Just look at the number of participants for this contest by Jia 88.3 FM radio station. 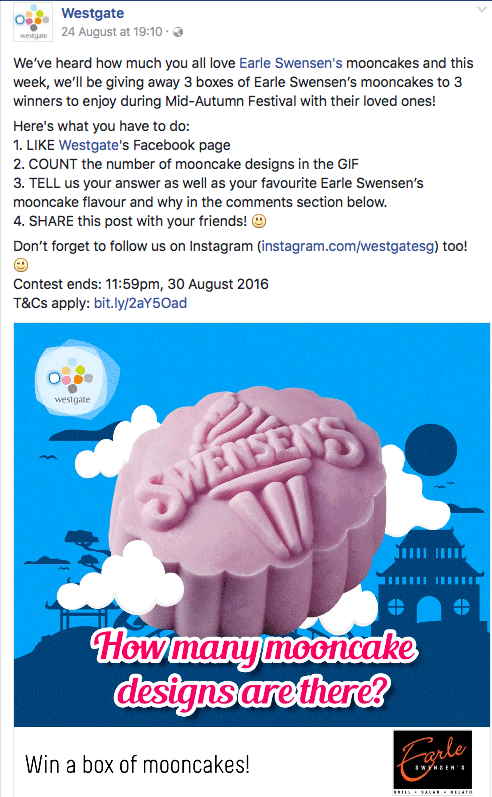 This second contest by Westgate, a shopping mall in the Western part of Singapore, involved getting participants counting the number of mooncake designs in a GIF image that is uploaded on Facebook. 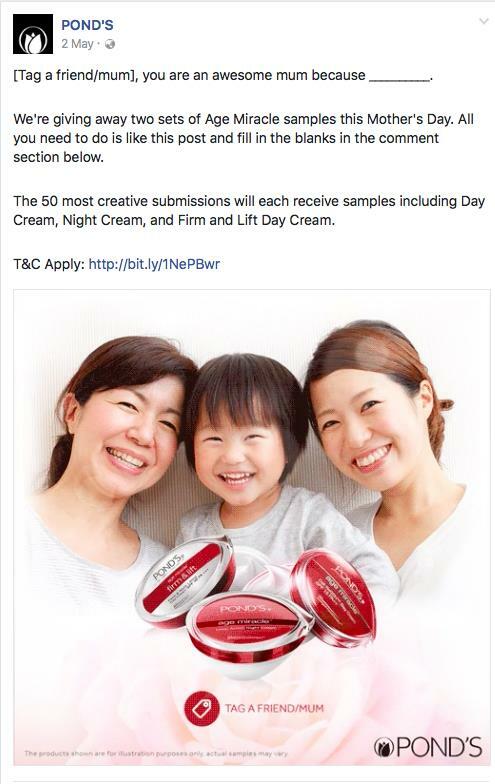 In addition, they have to write down their favourite Earle Swensen’s mooncake flavour in the comments. I love how it incorporated both a gamification element as well as the seeking of consumer insights in a single contest. This third variation of a simple online contest involved solving a riddle. 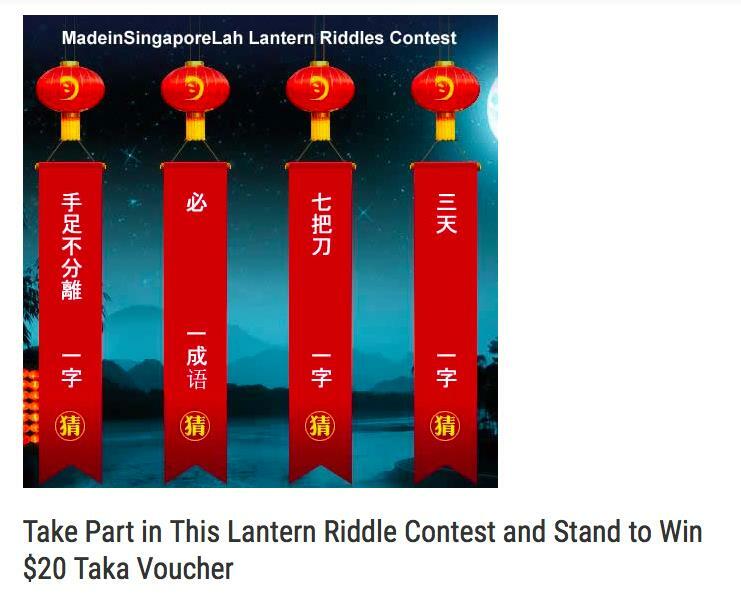 Orchestrated by the Made in Singapore Lah folks, it involves understanding what some mystical Chinese idioms mean and writing down the answer in a contest form. Before your imagination runs wild, do note that most writing contests on Facebook or other social networks are pretty short and succinct. You should not be running a short story competition asking your prospects to pen down a 3,000 word piece chronicling their most unforgettable day in school. Like Voting and Commenting contests, they can give you deeper insight into your customer’s preferences. However, the challenge is that the majority of your customers are unlikely to be good writers and hence, you need to manage the quality of your entries. I love our “Chief Influencer” Prime Minister Lee Hsien Loong’s recent writing contest titled “What would you do if you could be PM for 12 hours?” in preparation for the National Day Rally this year. Looking at the responses, you can tell that he is a pretty popular guy! While the prizes were more like movie swag than anything expensive, I like how the contest ties in thematically with the movie. If writing essays are not your thing, you may wish to use your social media accounts to harvest tips and ideas from your communities. Everybody loves to give their two-cents worth. 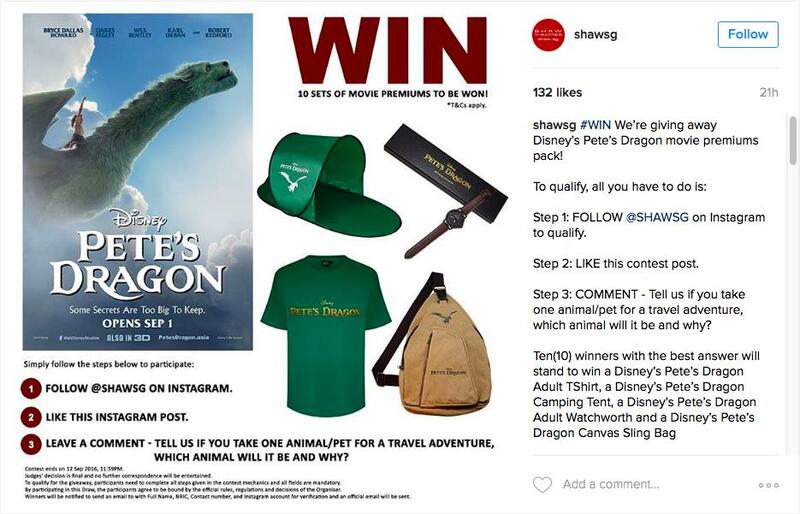 Both Facebook and Instagram are excellent channels for such idea crowdsourcing contests to take place. 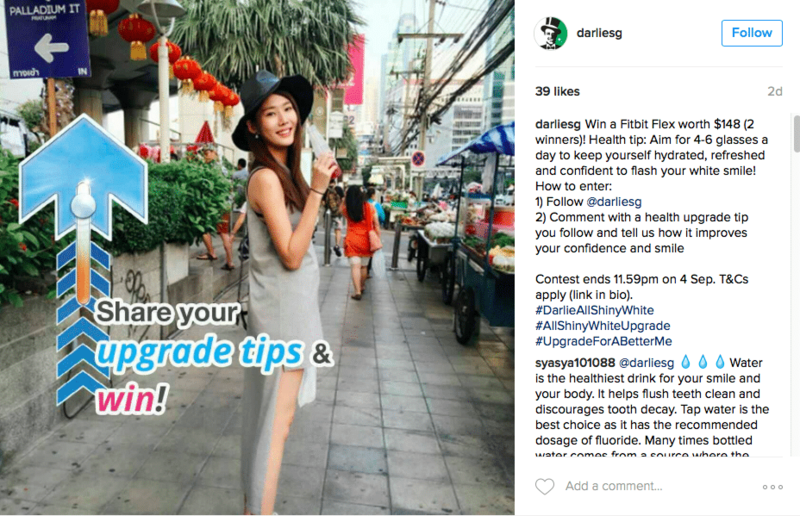 Check out the example below from Darlie Singapore, where winners can win a Fitbit Flex if they follow their Instagram account (@darliesg), comment with a health upgrade tip, and write how it improved their confidence and smile. 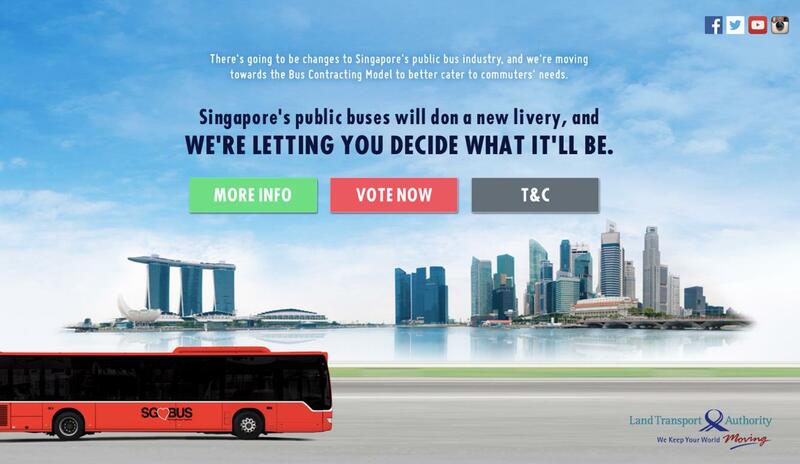 EZ-Link, the provider of public transport stored value cards in Singapore, has also run a crowdsourced ideas contest. 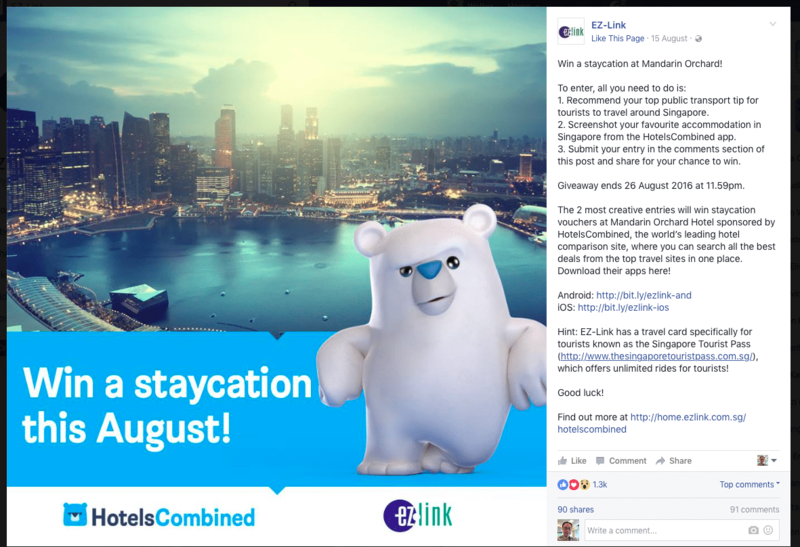 Together with HotelsCombined – an app allowing people to compare hotels on their mobiles– they ran a Facebook contest where the public could submit a public transport tip for tourist, screenshot their favourite accommodation in Singapore using the HotelsCombined app, and stand to win a staycation. Offers and discounts are one of the reasons why people gravitate towards your Facebook Fan Page or Instagram Account. Personally, I feel that promo codes and coupons are less effectively than other giveaways. After all, FREE or WIN are much more powerful trigger words than SAVE or DISCOUNT. Having said that, there are ways to make promo codes work well, like this hilarious example below from Occupy Democrat. An article in Wishpond (a wonderful social promotion app) highlighted this example below which offered a one hour massage at only $25. Note that the offer must be very clearly stated for coupons to work. This type of promotion can be run for a longer period of time, depending on how long you want the offer to be valid for. 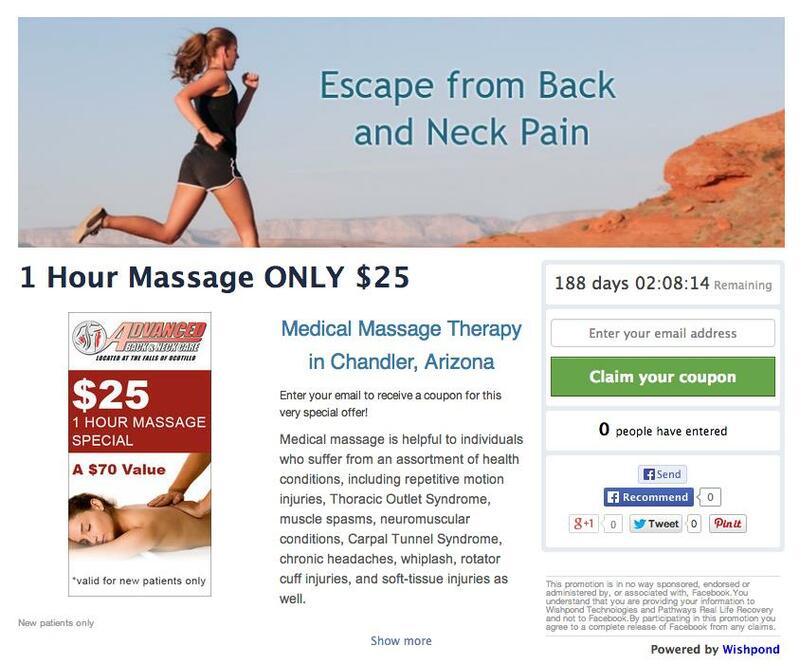 The below coupon by Advanced Back and Neck Care have been running for over 6 months. Wishpond suggested that you should make the tab visible on your Facebook Page (not hidden in the drop down menu) and that you could post about the offer every week or two to remind customers about the ongoing offer. 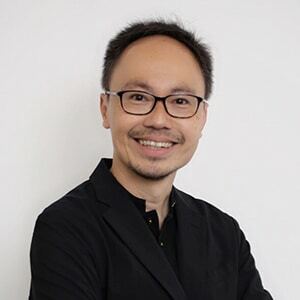 You can also work with social media influencers, like William Tan below. In the deal with Domino’s Pizza, participants can enter a promo code into a contest engine to enjoy a special deal. 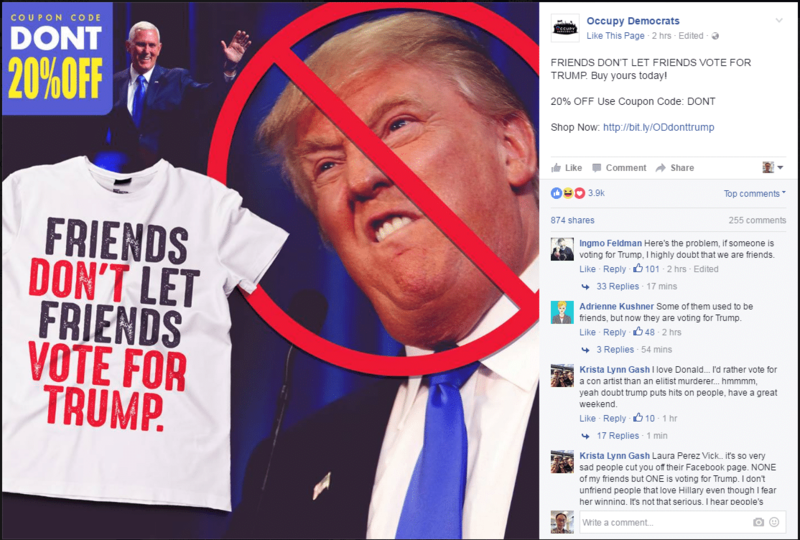 With our brick and mortar retailers bleeding red ink each day, it is natural that social media channels like Facebook could be used to drive traffic and purchases at physical stores. 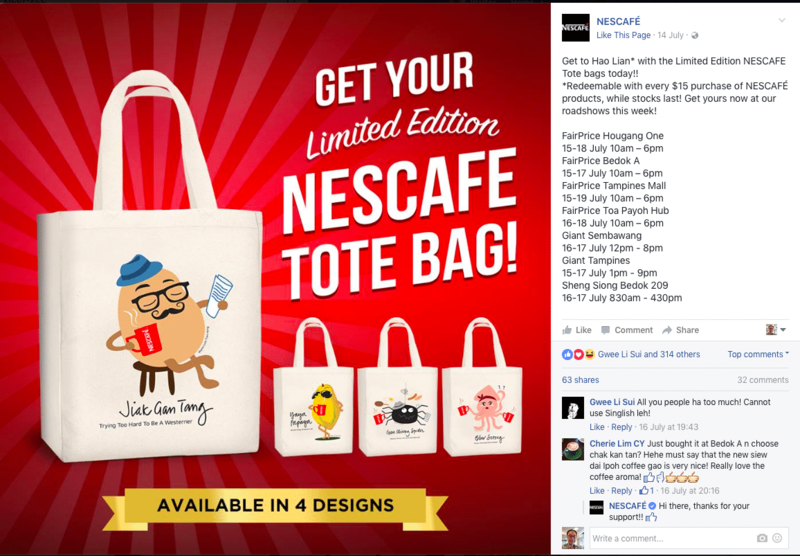 Here’s a great giveaway idea by Nescafe involving “Made in Singapore” bags featuring our colloquial language “Singlish” which can only be redeemed at roadshows in their stores with a $15 purchase of Nescafe items. So there you have it, a total of 9 social media contests and other promotional ideas for you to chew over. 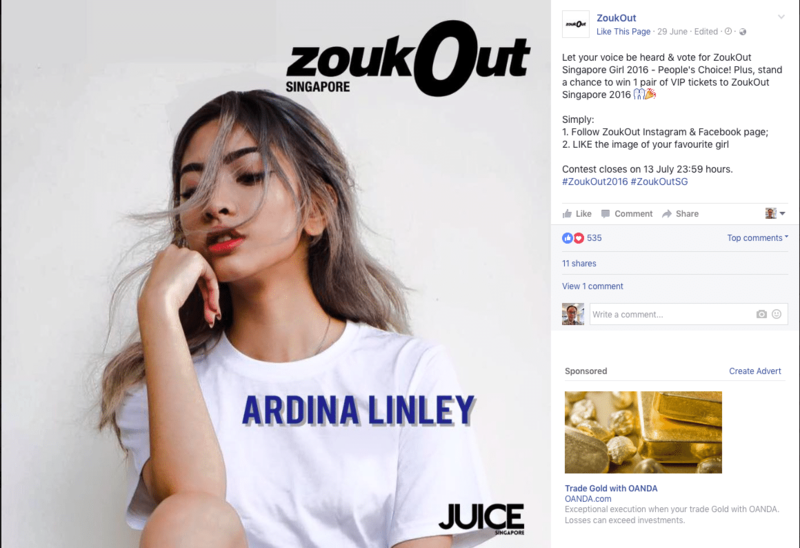 Most of these have been tested here in Singapore, and have helped their respective brands to gain online traction, drive social media fan growth, and increased sales and visitorship. 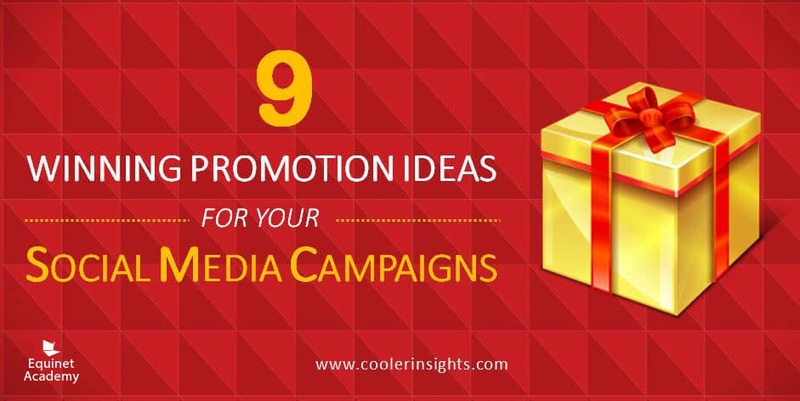 Remember that you need to have fun in creating your social media promotions for your campaigns. To get more Social Media promotion ideas, sign up for our social media marketing course! Thanks for sharing such an informative post. All the social media contest ideas are brillant. All the ideas are innovative. I had never seen such ideas. Thank You once again.